In spite of what some say, appealing to God as the basis of morality (or the explanation for anything else) does not automatically violate Occam’s Razor. Jerry Coyne wrote a piece in USA Today where he dismissed the claim that God is the basis of morality, in which he made the cringeworthy move of assuming that the “Euthyphro Dilemma” dealt a crushing blow to theologically grounded ethics. My friend Matthew Flannagan responded to Coyne, noting that this was one of those instances where a scientist had gone crashing headlong through a philosophical issue and made a bit of a hash of it. Flannagan documented this, noting the way that Coyne’s attempt to fend off criticism has failed, and noting that his selective quotation from Thibodeau is less than forthcoming. In the process, he noted that philosopher Brian Zamulinski had weighed in on the discussion. Brian had actually contacted Coyne before his first article appeared, attempting to inform him of some of the developments in discussion around the Euthyphro dilemma (essentially trying to help Coyne avoid embarrassing himself). Coyne, it seems, chose to ignore the help offered, which has clearly hurt the quality of his criticisms of divine command ethics to the point where those criticisms fail completely. But that’s not what I want to talk about here. 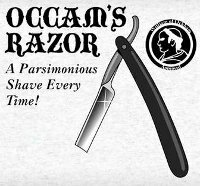 Occam’s Razor is the principle that all other things being equal, simpler explanations should be preferred to more complicated ones. If someone purported to explain an observable phenomenon by postulating an unobservable entity that created and sustained the phenomenon but did nothing else, the “explanation” would be question-begging and therefore vacuous. It would tell us no more than that the phenomenon existed and persisted, effectively repeating the original claim in different words. Using the same unobservable entity to “explain” a larger number, a greater range, or different aspects of, observable phenomena would do nothing to improve it as an explanation. If it fails with respect to small matters, it fails with respect to great ones as well. Hypothesizing that the unobservable entity existed necessarily would not improve it as an explanation either. The ultimate destiny of such an entity is to become the traditional God of theism, the ad hoc hypothesis than which no greater can be conceived. Therefore, no observable phenomenon constitutes evidence for God. I think there are a couple of problems with this analysis. First, Brian says that if we were to postulate an entity in order to explain a given phenomenon, where that entity (as far we know) did nothing else, we would be committing the fallacy of begging the question. But this seems quite clearly untrue. “Begging the question” is what happens when a person makes an argument that assumes from the outset that its own conclusion is correct. Examples of question-begging lines of reasoning would include: “You are not justified in believing in God because there is no reason to believe that God exists,” or “talking about non-material entities is nonsensical, because non-material effectively means non-existent.” But inferring the existence of an entity from a given phenomenon, or postulating the existence of a given entity in an attempt to explain a given phenomenon, as many theists do when they claim that God explains the existence of moral facts, does not beg the question. It may be a mistaken or unwarranted inference, but it is neither question-begging nor vacuous. If in fact the existence of something like a god really is the best (or even the only) way to explain the existence of one specific phenomenon, then postulating the existence of such an entity is quite justifiable, maybe even necessary (as long as one believes that the phenomenon is a real one). True, if the entity that we postulated was postulated only to explain one phenomenon and to do nothing else, then we have to be careful not to describe the entity in unwarranted detail. For example we might think that the kind of entity required to explain the existence of moral facts must be very powerful and good, but we shouldn’t also say that this entity raised Jesus from the dead (unless we had other reasons for thinking so). I have explained in part elsewhere why I think that appealing to God in order to explain the existence of moral facts makes sense. I did this in my blog on the conditional premise of the moral argument. It would be pretty strange if God was called on only to explain moral facts. You would, in fact, be postulating an extra entity for only one reason. Secondly, there’s a faulty appeal here to the principle that “if it fails with respect to small matters, it fails with respect to great ones as well.” The idea here is that appealing to God is question-begging when used to explain moral facts, so using God to explain anything else just multiplies question-begging arguments and does not improve things. As noted, the appeal to God to explain moral facts is not question begging. But even if it’s just weak for other reasons (let’s say you think it gets into trouble with Occam’s Razor because it introduces a new entity – God), it’s not automatically the case that more appeals to God in order to explain other phenomenon do not make the God hypothesis any more likely, or the God explanation any more plausible. Here’s why: If there is one entity that explains one phenomenon, you might find that a little ad hoc. You might think “What? So God just pops up when you can’t explain this one thing – moral facts – and then vanishes again? That’s all this God story is good for?” Even though I think that God is the best explanation for the existence of moral facts, I agree that it would be pretty strange if God was called on only to explain moral facts. You would, in fact, be postulating an extra entity for only one reason. But of course, that’s not the only reason that philosophers of religion might infer theism, or appeal to God as an explanation. There’s still the appeal to God to answer the contingency question (“Why is there something rather than nothing?”). There’s still the appeal to God as the best explanation of the origin of the Universe (where a number of non-theist philosophers suddenly have no problem with positing the existence of millions of other universes). There’s still the appeal to God in the face of the fine tuning of the Universe for the existence of intelligent life. There’s still Swinburne’s appeal to God to account for what he deems the objectivity and transcendence of beauty. And of course there’s the argument that God’s existence is the best explanation for the historical facts concerning Jesus of Nazareth, along with any arguments for the reliability of Scripture. Now there are two broad ways to go here. You can offer multiple different explanations of various kinds to explain all of these states of affairs in such a way as to eliminate the need to appeal to God. You can posit a multiverse (which, of course, vastly multiplies the number of entities one believes in), you can defend an error theory of morality so that there are no moral facts after all. You can come up with fairly complex psychological and/or evolutionary accounts of moral epistemology. You can posit the existence of non-material platonic entities that are moral facts. You can simply say “I have no idea.” You can develop theories of how people conspired to make Christianity seem plausible by lying about historical events and so on. But this isn’t simple. This whole cluster of explanations needs a very large number of claims to be granted (and all of them must be granted), and a number of contested theories to be accepted. By comparison, maintaining that God is an underlying cause for a whole range of phenomena like this is simple. God in this context is one entity that resolves many questions as opposed to a truckload of different entities. Put differently, the God explanation brings simplicity to the picture by bringing parsimony to one’s overall outlook in fewer steps. [E]volutionary intuitionism is a better explanation for morality than God is. For one thing, it does not violate Occam’s Razor by postulating a new kind of entity. For another, it is testable. And, it passes the tests. (It is scientific in that it has empirical implications that are confirmed by observation.) Since evolutionary intuitionism is a better explanation for morality than God is, God is obviously not the best explanation for morality. Therefore, morality is not evidence for God. One last point, it is a fiction that any of us are of value; it is not a fiction that some acts are wrong. There would be problems with this contention if extended foundational attitudes were moral principles but they are not moral principles. Zamulinksi’s evolutionary intuitionism, then, however good a theory it might be, is literally incapable of being a better explanation of the moral facts than an appeal to God, since it is not an attempt to explain moral facts at all. It deals with our attitudes and the consistent application of those attitudes and certain stances that we take towards people, even where those attitudes are based on pure fiction. At best, what he has shown is that sometimes our behaviour is inconsistent with the values that we actually believe in (those are the moral facts, if our belief is correct), and our intuitions may often alert us to this fact even in the absence of drawn out reflection. He’s right about that, but wrong to think that he has given any explanation of the moral facts. In short: Brian Zamulinski is correct to observe that appeals to the Euthyphro dilemma are no threat at all to those who appeal to God as the basis of morality. However, he is mistaken to say that this appeal is question-begging, and he is equally mistaken to suggest that such appeals must be seen to violate Occam’s Razor. He is also mistaken in thinking that he has come up with a better explanation of the moral facts than that offered by the appeal to God, and as such those who believe – and who have argued, as I have elsewhere – that God is the best explanation of moral facts, have nothing to worry about in the face of this challenge. Do moral facts not require an explanation? Previous Previous post: Reason Rally 2012 – Dollars or Sense? Next Next post: Are Theodicies ad hoc? Glenn, given that Christians hold God to be a being of perfect, supreme goodness and greatness, why do you think that moral facts cannot exist unless God exists? Could they not be grounded in some lesser being—perhaps the creator and sustainer of the universe, but not necessarily a supremely powerful, knowledgeable, or good being? Thomas, for the kind of argument I was discussing on MandM the answer is no. This argument contends that the nature of moral obligations are best accounted for in terms of the commands of a loving and just God. If God is either ignorant , lacking in rationality, or lacks certain attributes such as being loving, just, good and so on then its possible for him to command evil, either because he mistakenly thinks something has certain properties or consequences that it does not or he understands its features but draws the wrong conclusions. Alternatively if God lacks certain character traits he can command malicious or evil things because he is indifferent to human welfare, or malicious and so on. If its possible for God to command such things then moral obligations can’t be identified with his commands. Thomas, one way of looking at it is this: Any moral theory that we come up with has to explain the moral phenomenon that we already know about. So we’re trying to come up with a theory that will account for the moral obligations that we already take ourselves to have, as well as other obligations. The sorts of obligations that we do actually take ourselves to have are reasonably well known to us, and are grounded in principles that are good – love, kindness, honesty, beauty and so on. So explaining moral duty in terms of a specifically good God has a clear head start over any other sort of God. As Matt indicated, the intellectual properties matter here because a good – let’s say a very well meaning – but really stupid God might command us to stab each other in the eye because he thinks that will make everyone really happy. Of course that’s an extreme scenario, but the solution is the opposite extreme: A perfectly rational and well informed God. As for God’s trait of being all powerful and not just really really powerful, what I’ve always said is that what matters is God’s relationship to creation. What’s really needed is that God is the author of creation and so God’s intentions for the way we live can be said in every sense to be the proper way for creation to function. Alternative theories to mine in which a being like this might be the lesser of more than one really powerful being will stand or fall on the independent plausibility of polytheism. But such theories, I think, definitely fall afoul of Occam’s razor. Here we see one of the problems with Occam’s Razor: the “simplest explanation” is often in the eye of the beholder. I think “God” is a much simpler explanation than the number of assumptions that must be made in order to accept the evolutionary explanation. Occam’s Razor is a lazy man’s tool, anyhow. Re: Occam. I think the real brilliance and value of this post is not regarding the moral argument per se, but the bit in the middle about how positing one entity — God — solves a whole cluster of issues and problems. And it is so utterly true. Once one posits God, a whole bunch of things fall into place. It is, perhaps, like C.S. Lewis noted when he said he believed in the sun not because he sees it but because by it he sees everything else. It’s like the unbeliever is playing whack-a-mole with God. Whatever the question, he keeps popping up as the inconvenient answer. On some moral arguments for theism of the Kantian variety what matters also is that God providentially governs the universe in such a way that happiness and virtue ultimately co-incide. So God would have to be loving and just, rational fully informed, impartial and providentially order the universe so that virtue and happiness co-incide, and have designed humans for a particular function. The point is that various features of the “moral landscape” so to think are intergrated and explained by God orthodoxly conceived, different traits each explaining a different feature and intergrating it into a whole. Hi there. I would like to ask Glenn whether or not you feel that the Bible teaches situational ethics or moral absolutes. Moral and ethics have become fascinating to me because I now find that, despite being brought up to believe that lying is absolutely wrong I now am obliged religiously to believe that lying/misleading the enemy for God or your religion can be right situationally. Frank, I would describe myself as an absolutist (by which I just mean that there are moral facts – objective moral duties). We certainly do need to take context into account when discerning what those duties are, however. For example, I think that lying is sometimes required, although usually forbidden. I hold to a divine command theory of morality, so the act itself is not inherently right or wrong, it’s God’s commands that constitute objective moral duties. So when Lot offered his daughters to the raging mob outside his house in place of the two strangers for sexual gratification, this is situationally right? What about ordering Israeli troops to put children to the sword because they were in the wrong place at the wrong time? The point I’m making is that such acts today would be considered crimes, yet apparently came about through the command of a perfectly-moral God. Lot later in Hebrews is called a righteous man. When Christ executes vengeance on the ‘wicked,’ will this mean also those in this world who have never even heard of him? Woah, wait, slow down Frank. Which question do you want to ask? I’ll set the last question aside as it’s a completely different issue (seriously, where did it even come from)? Earlier you were asking about whether I believe in moral absolutes or whether I believed in situation ethics, and I gave an answer. Now you seem to want to ask about a whole slew of examples of commands (and other things!) and get me to answer, one by one, whether it was right. If I offer any answer on these, I fear you will simply come up with a new list, and then another. So could you just lay it all out in one comment, Frank: What is the issue, and where is this going? Being raised a religious person I had accepted all the Bible stories and its bloodshed without question because children like stories, especially exciting ones. Now I’m older and hopefully wiser, my ethical stand causes me to question the morality behind accounts and compare this with what I now know as a 21st century man. My questions were not meant for you to answer each one, though if you could that would launch an interesting discussion. The main point, however, is that if God is omnipotent, why have humans been used to carry out divine justice? Naively I thought God and the Bible taught moral absolutes and I tried to live by Christ’s more clear principles (than the questionable morals of Old Testament accounts). Now I find, with minimum analysis that lying is good if it serves one’s religion, women and children can be expendable if it’s for the ‘glory of the lord,’ and righteousness comes in strange wrapping. ‘God’s’ fatwa against the Amalekites is understandable measured against the Edenic story, isnt’ it? I keep hearing the expression: “God has sufficient moral reason for this or that.” I don’t know what this means. Could it be that our world is so messed up simply because as a species we can’t decide whether or morals should be absolute or situational? Hope that’ll do and I hope that you can answer these questions. I ask them genuinely. “The main point, however, is that if God is omnipotent, why have humans been used to carry out divine justice?” If you don’t know what it means when people say “God has sufficient moral reason for this or that,” just remove the word “moral.” God – an all knowing and perfectly good being has reasons to command something. If that’s true, then there’s a good reason for it to be done (otherwise an all knowing and good being wouldn’t think that there was a reason to command it). Why does God use human beings to carry out any of his plans? I don’t know. Why isn’t the arrangement completely different, and why doesn’t God perform miracles in order to make it rain, or for the sun to shine – instead of having those things happen as part of the regular course of nature? Why does God allow his kindness to be shown through people? Why not just somehow show it directly? I guess the reason that I don’t invest a huge amount of time answering this question is that I don’t see what ultimate difference that makes. what do you mean that it is a miracle when it rains? All this is known by science and now we know. Are you saying that in some sentimental way I should accept this as a miracle and everything will be all right? Very Christian, but it doesn’t answer the questions I pose. Of course, I could remove the word “moral” from the sentence – what difference would that make? If we removed the word “moral” from the expression “morally perfect” how would that answer anything. I mean no disrespect, but isn’t Dawkins right when he calls this a cop-out? All you seem to be advocating is ‘leave it to God,’ ‘go with the flow,’ ‘she’ll be right.’ If it is true that the West modelled its morality system on Biblical ethics then we could rightly reason, albeit ironically – God help us! The difference discussing such matters makes is that it helps us decide whether we live fully or some desperate half-life that being enslaved to a religion obliges us to live. Don’t you think that’s important? I didn’t say it was a miracle when it rains, Frank. have another read. The rest of your post is a very obvious misrepresentation of what I said. Seriously, “she’ll be right”? Thanks for visiting, Frank. theapologeticfront.comYour failure to face these questions is nothing new. So far every Christian has run for the hills rather than face these ultimate questions.The last one I asked was also busy. Ignore the personality and concentrate on the issues. Turn the other cheek and let me slap that one as well. Are you a Christian, or did I get that wrong too? A woman approaches a man to ask for a loan to pay for an operation on a relative’s eyes. This is the only option for her. Failure to do so would end up with the person going blind. The man says that the only way he’ll lend her the money is if she slept with him. Is she right to commit adultery for the sake of the relative? As a Christian, if she did not do this, she would see adultery as a moral absolute, is that correct? David Koresh and Jim Jones believed they had to act situationally, so do ‘Christian nations’ when in times of war. The Yorkshire Ripper believed God required him to murder prostitutes. Can you prove that he wasn’t receiving a message from this source and remains a martyr to this day? You and I know that ‘thou shalt not kill’ as part of the ten commandments was meant only for the Hebrews, yet Christ stated that even feeling enmity and anger against a brother is a sin. The problem is that when humans use the Bible for its guide to morality, we get thousands of different interpretations of the said verses. Is war always wrong? (defence, for instance?) If defending oneself in times of war is right then conscientious objection is morally wrong. First you say you are an absolutist and then you claim we need to ‘take context into account.’ I find this confusing. Do you mean morality is absolute or situational. What is divine command theory of morality? Do you not realise that the divine right of kings came from such a belief? What about the absolute authority of government and the courts who rarely, if ever, take responsibility of their errors? ‘Lying is sometimes required’? Who decides when lying is correct? Plenty of this has happened in the past including in the Bible. In his omnipotence and omniscience, why does God need humans to do this for him? Frank, if you start out with a question, then deliberately act a like a jerk and then when people – like normal people would – decide not to give their time to you as a result, you don’t get to accuse them of running for the hills. This is a place for civil discourse. Please bear that in mind every time you comment here. Also, it’s best not to tell me how to run the blog. Any concerns, contact me privately. As for the rest, I’m sure you’ve spent a lot of time talking with people about what you call your “ultimate questions.” I’ll look at your comments (which have nothing to do with this blog post on Ockham’s razor, God and morality) and offer some thoughts on them if I ever find myself with time that I have nothing else to do with. Frank it would help if you informed yourself of what situation ethics is, and also read some of the voluminous literature on lying, both from within and without moral theology before you ask questions that have been give detailed answers for centuries, make false dichotomies and then claim no one can answer you. This loosely connected cluster of statements and questions goes wrong all over the place. it is not “situational” to believe that one is acting on a divine command. Nor, for that matter, does belief in divine commands mean that we have to be completely credulous of every single claim that anyone has ever made about being told by God to do things. As for what “you and I know,” I know no such thing. The prohibition on murder has always been understood as a biblical command that reflects God’s intention for all people everywhere. The stream of consciousness argument (argument for what? I’m not sure) is simply uninformed. It is strange that you use the word ‘uninformed,’ Glenn. So far you’ve told me what you think, but unlike me, you have not furnished any examples. Would you care to do so? Yes, it was stream of consciousness, but where are your rebuttals? Simply stating I’m ill-informed is not the basis for a discussion, Glenn. Christians should not view morals as ‘flexible’ given the situation – rebut that…oh, and don’t forget to give examples. Thanks. Matthew Flannagan – No, I want you to inform me on what you believe situational ethics is. I know what it is. I have asked specific questions and no one is answering them. Can you? You say I have produced ‘false dichotomies,’ please illustrate. When is it right, under any circumstances, to take the life of a child such as in the Canaanite wars? Where is the false dichotomy? Do you want a genuine dichotomy? claims he is perfectly moral and personified love! Oh, and the distant ancestors’ crime? Sound familiar? Children paying for their parents’ crimes. Even humans don’t do that! Hey, don’t shoot the messenger; I’m just asking questions. It’s time to shut the doors of the university chambers and debate on a fruit box in the community parks. I should mention of course that the docier is the that of religious belief if the Bible contains forgeries who knows what the truth is. The fact that you feel that belief in God (and submission to him) is tantamount to slavery and leads to a ‘desperate half-life’ shows that you likely have no real interest in being persuaded that he can exist. If a God exists, who made this world and everything in it, then (logically) belief in Him would make life for His creatures fuller. Define ‘fuller’ however you like: richer, truer, more purposeful, more meaningful, more reasonable. I think the objection comes to premise two of the moral argument, that objective moral values and duties exist. It seems that natural selection explains not only the rise of altruistic behaviour in homo sapiens, but also the strong intuition that said altruistic behaviour is objectively binding on humans. If people didn’t believe their values were objective they would stop following them in short order, in order for morality to have an evolutionary advantage, which it does, people have to believe those values sincerely, and so evolution gives rise to the illusion of objectivity. This doesn’t prove the illusion, it only proves that in the absence of God to serve as an objective anchor, moral intuition would be illusory. Occam’s razor, then, which tells us not to multiply causes beyond necessity, would eliminate God as an unnecessary extravagance. Is it possible that our moral intuition is due to the fact that there is a God serving as an objective lawgiver? Yes. But we already have an explanation for morality, so there’s no need to speculate an additional cause. It’s simpler to assume that objective moral values and duties simply don’t exist. What the defender of the moral argument for theism has to prove is that there is good evidence for believing that moral values and duties are objective, other than saying that the alternative is unpleasant. Do you mean to suggest that relativists and error theorists don’t live according to any code(s) of practice? Right, and if there really are no moral facts after all, then obviously we wouldn’t be justified in appealing to God to explain them. But the moral argument is directed to those who are moral realists (i.e. people who think there are moral facts). Sure, if moral facts are illusory – something to which intuitions point that really isn’t there as an objective truth – then there’s no need to appeal to anything, God or otherwise, to explain those facts (since there are no such facts to explain). “But we already have an explanation for morality, so there’s no need to speculate an additional cause.” Well no you don’t have an explanation for “morality,” at least not in the sense that this article is talking about morality. I wrote here about moral facts – something objectively true. You’re only talking about the psychological phenomenon of holding *beliefs* about right and wrong.